...019 NIH Grant for $367,500 for In Vivo Ultrastructure of Chorioretinal Disease. The principal investigator is Yuhua Zhang. The program began in 2015 and ends in 2019. Below is a summary of the proposed work. ...2017 NIH Grant for $330,750 for In Vivo Ultrastruture of Chorioretinal Disease. The principal investigator is Yuhua Zhang. The program began in 2015 and ends in 2019. Below is a summary of the proposed work. ...016 NIH Grant for $330,750 for In Vivo Ultrastructure of Chorioretinal Disease. 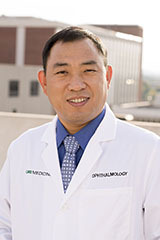 The principal investigator is Yuhua Zhang. The program began in 2015 and ends in 2019. Below is a summary of the proposed work. OUTER RETINAL TUBULATION IN ADVANCED AGE-RELATED MACULAR DEGENERATION: Optical Coherence Tomographic Findings Correspond to Histology. University of Alabama Receives NIH Grant for Studying In Vivo Ultrastructure of Chorioretinal Disease. Yuhua Zhang is at the Department of Biomedical Engineering, University of Alabama at Birmingham.